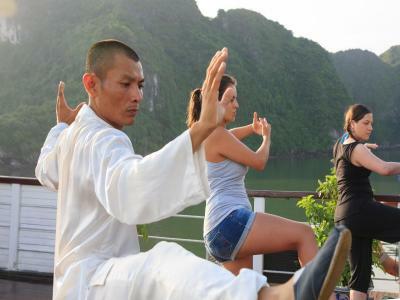 Lock in a great price for Garden Bay Premium Cruise – rated 8.9 by recent guests! We had a wonderful stay with our amazing tour guide- Tom. He was so attentive, helpful and funny. He took care us and tried to fulfill all the guest's request. The room we booked was a Deluxe sea view. It comes with a big window and an awesome view. We also were happy with a clean room, good aircon, hot water. Thank you and keep up your good job. Highly recommended! 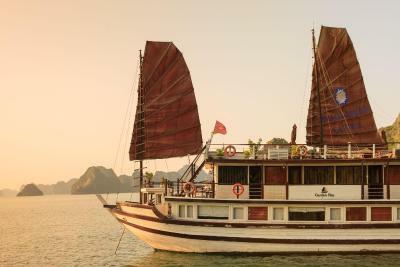 Great cruise, excellent excursions and nice food. The staff were all very nice too. Fantastic staff, always smiling, always paying attention. 100% service. Delicious food, lots of opportunity for activities. 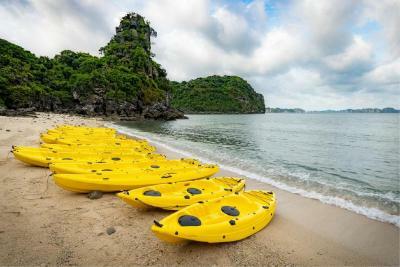 We kayaked, did morning thai chi, learned to make spring rolls, had wonderful meals, visited a floating fishing village and also had time to relax and enjoy the trip. The weather was rather bad to enjoy such trip in 100%, but: The food was delicious The staff was nice and It wasn’t that crowded as It might be in peak season. The ship is rather small in comparison to otherS and rather old I think. 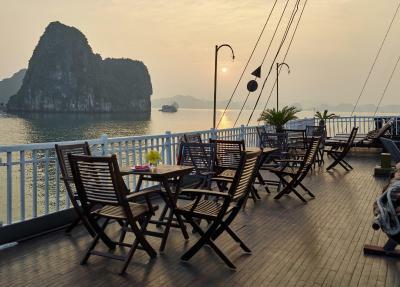 Ha Long Bay is great. I recommend staying two nights. One night is not enough. Boat: The staff are brilliant. They clearly care you have a good time and respond well to feedback and requests. 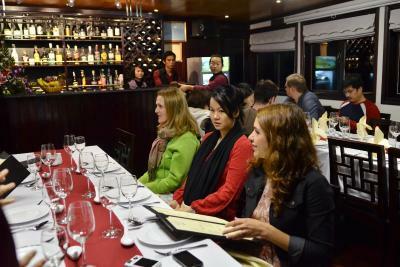 The food was good with a mix of euro and Asia cuisine. Room, bathroom and bed linen all clean . Excursions: The 2nd day (3D2N) the kayak/cave trip was great as at one point we were the only people in the cave which was great in comparison to the other cave we went to on day 1 which was just unenjoyable.the fishing village trip was a bit touristy but lovely to be away from the constant sound of Diesel engines! 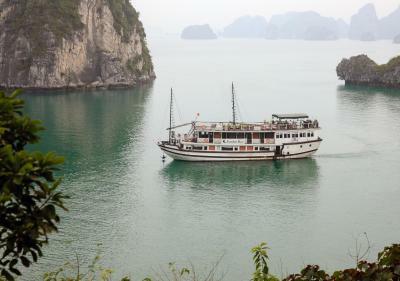 HaLong Bay is super pretty. We hear rumours (unsure if true) the overnight boats will be stopped by the government which is a shame. If they had better holding tanks for poo, varied the location they go and stay limiting numbers sustainable tourism should be possible. Food was amazing, both presentation, flavors and diversity. 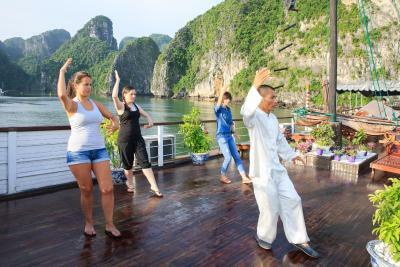 Activities were varied and visits to Fishing Village and Cave nice as planned. Our Guide was very motivating. 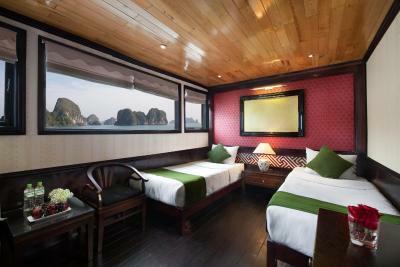 I and my colleague had a short trip to Vietnam, after finishing all the work, we had 2 days left and we decided to go to Halong Bay with Garden Bay Premium. The shuttle bus picked us up from our hotel about 07:50 am and drop us off at the airport which saves time for us a lot. 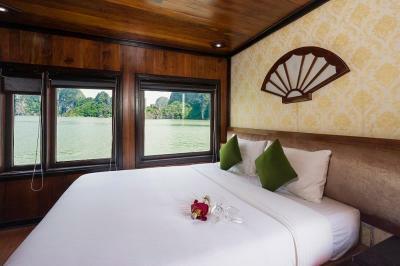 The balcony room was beautiful, I just want to lay on my bed to see nature with a stunning view. 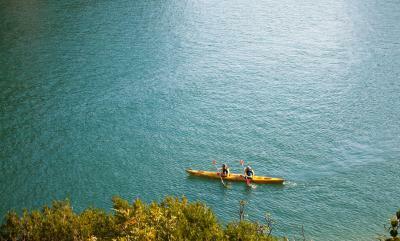 My partner like kayaking and bamboo boat so much. The vegan food was delicious, the staff were helpful and take care of us. We had 2 beautiful days and will come back. Thank you, Rosie, who help us to arrange the transportation. She is helpful and informative. Thank you, Anna- Cruise manager. 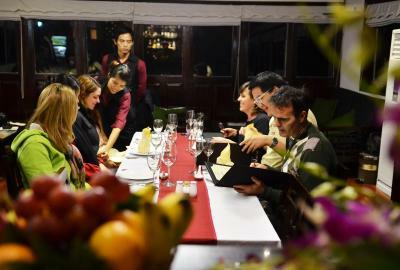 Food was excellent up near the best I had in Vietnam. Staff were very friendly and helpful. The areas visited were spectacular and very peaceful. Garden Bay Premium Cruise This rating is a reflection of how the property compares to the industry standard when it comes to price, facilities and services available. It's based on a self-evaluation by the property. Use this rating to help choose your stay! 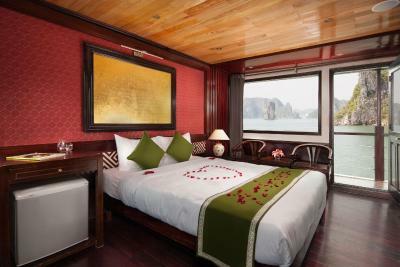 One of our top picks in Ha Long.Featuring wooden Oriental design, Garden Bay Premium Cruise features an in-house restaurant, and offers cozy rooms with attached bathroom. 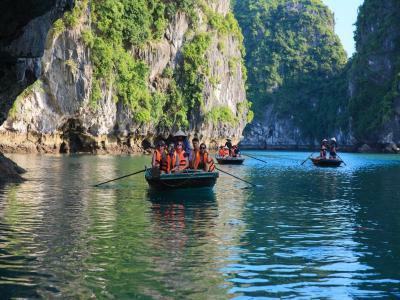 It provides visits to dramatic caves and untouched beaches through a less crowded route. Fitted with parquet flooring, nonsmoking air-conditioned rooms are simply furnished with a personal safe, a mini-bar, desk and seating area. 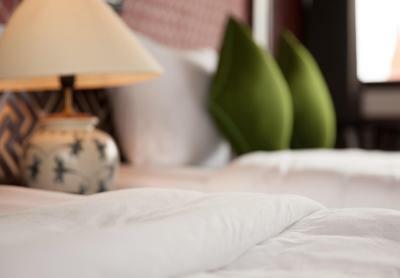 Private bathrooms are equipped with a hairdryer, shower facilities, slippers and free toiletries. 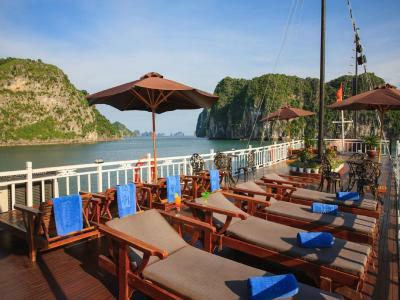 Garden Bay Premium Cruise operates a 24-hour front desk and features a sun deck where guests can chill out at the lounge chairs and enjoy spectacular views of the bay. 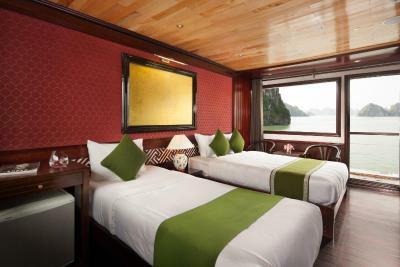 Guests may also play cards or board games, while fishing can also be done on board. 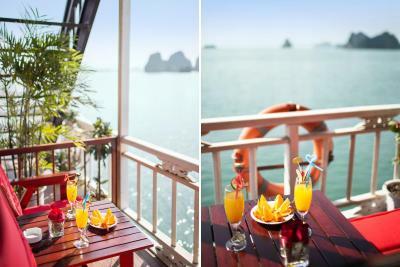 The restaurant serves delectable Vietnamese and international cuisines throughout the day, accompanied with panoramic views of the bay. A variety of drinks and beverages are also offered at the bar. From the dock, Garden Bay Premium Cruise is just 1,650 feet to the nearest bank or ATM/cash machine and 1.9 mi to the nearest hospital. Hanoi city and Noi Bai International Airport are within 103 mi away. 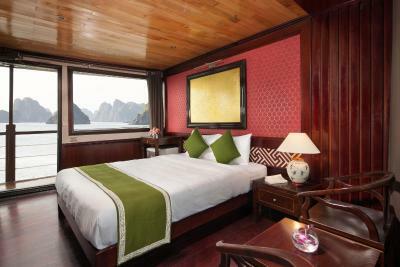 This property also has one of the top-rated locations in Ha Long! Guests are happier about it compared to other properties in the area. 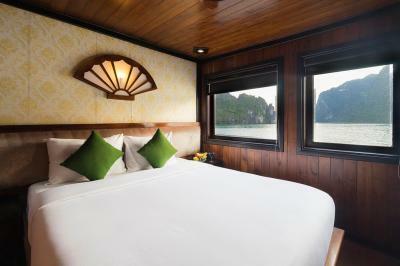 When would you like to stay at Garden Bay Premium Cruise? This air-conditioned room opens up to views of the sea. The seating area is fitted with a desk and mini-bar. 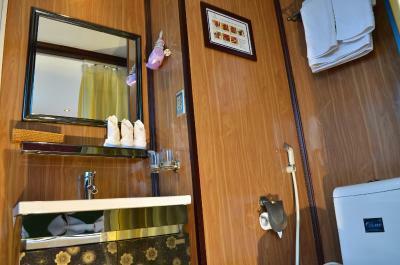 The private bathroom includes shower facilities, a hairdryer and free toiletries. 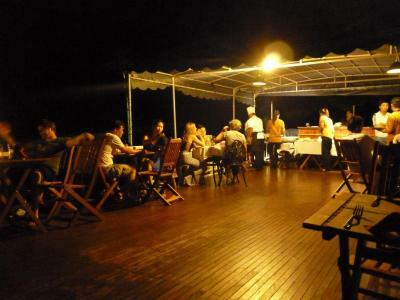 Public parking is available at a location nearby (reservation is needed) and costs VND 70077.20 per day. 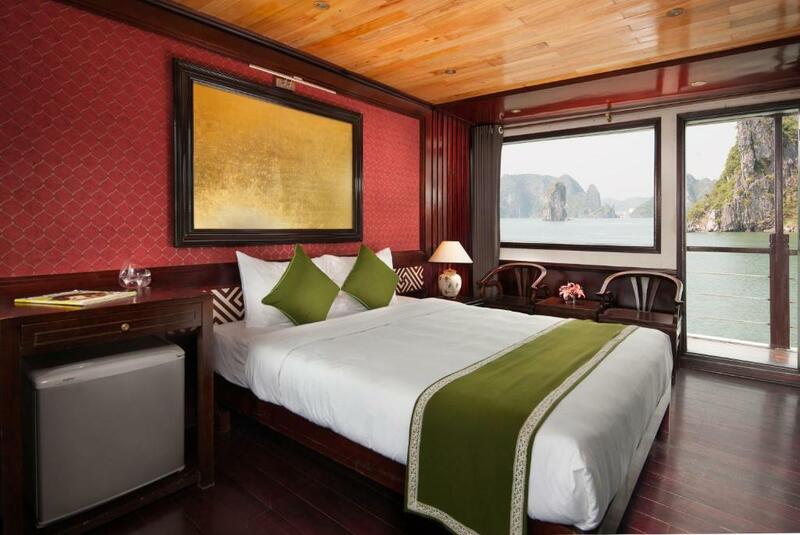 This air-conditioned room features a private balcony that opens up to views of the sea. The seating area is fitted with a desk and mini-bar. 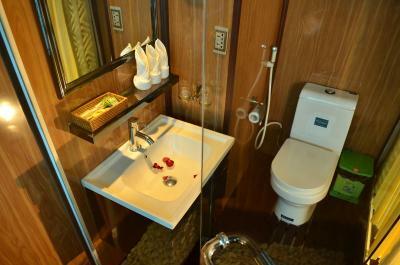 The private bathroom includes shower facilities, a hairdryer and free toiletries. 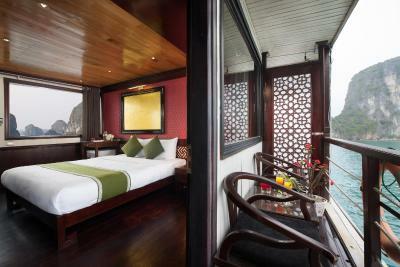 This air-conditioned triple room features a private balcony that opens up to views of the sea. The seating area is fitted with a desk and mini-bar. 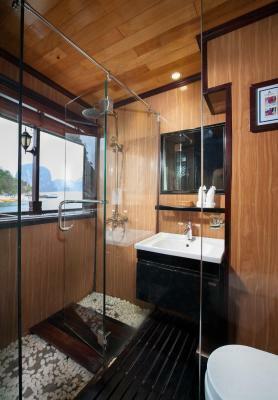 The private bathroom includes shower facilities, a hairdryer and free toiletries. House Rules Garden Bay Premium Cruise takes special requests – add in the next step! One child from 5 to 8 years is charged 50 % of the room stay per night and person when using existing beds. One additional older child or adult is charged 100 % of the room stay per night and person when using existing beds. One child from 8 to 12 years is charged 75 % of the room stay per night and person when using existing beds. Garden Bay Premium Cruise accepts these cards and reserves the right to temporarily hold an amount prior to arrival. All inclusive packages will start at lunch time and will end after lunch on the day of departure. 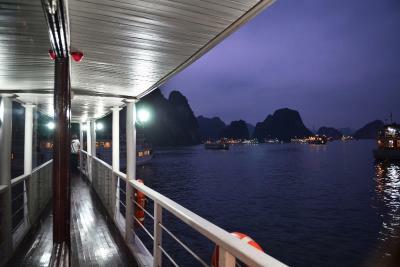 An advance registration is required by Halong Bay Management Authority and Port Authority Permits. 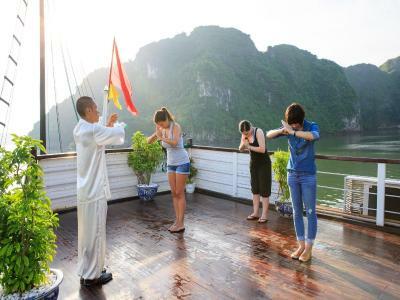 Guests must provide full name, date of birth, nationality, passport number/ ID number, and Vietnamese visa expiry date for all passengers under Special Requests box. Upon check-in, guests are required to present a valid passport or ID to board the cruise. Please present a valid passport or ID and visa before boarding the cruise. Please contact the property using the Special Requests box when booking, or contact the property directly with the contact details provided in your confirmation. Guests are expected to confirm with the property at least 2 days prior to arrival. expensive drinks, for drinks bought during “happy hour” we were charged with full price, but found it out when we were back in Hanoi. In one of our rooms water was dripping from ceiling. 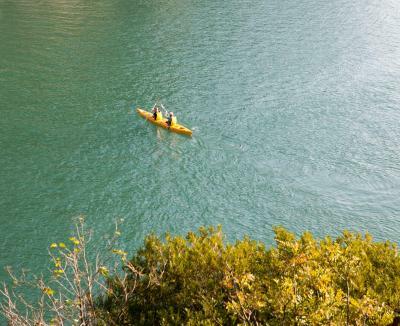 Kayaking was nice, but I rather thought that someone will go with us, show us something interesting, not just: here’s your kayak, you have 40 minutes, enjoy... I thought that we will go somewhere, where we need to climb a little and as a “reward” we will see some spectacular views of the bay, but nothing like this... we sow rather small cave and fishing village. It may be a bit overpriced for Vietnam. However, the staff makes it worth it! We had back luck with our room that had water leaking and a bad smell. The staff was quite supportive but the equipment is run down and needs maintenance namely the faucets/taps. Linens and furniture overall also show wear and tear marks. Pricey wine even though a resonable selection, but if you want wine in Vietnam it is expensive anyway. Awesome cruise and great experience for the 2 nights 3 days. Special thanks to Anna Vu. We were a bit late booking and ended up with a more expensive option. We were very happy with that decision. Everything was well organized, comfortable and made for a lovely time, even though we had cold weather. The staff was a delight and the food excellent. We did two nights, which was perfect. 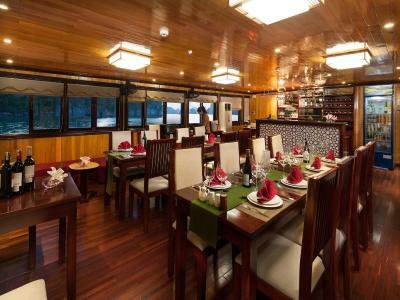 Our day boat on the 2nd day was so nice and comfortable with excellent food. 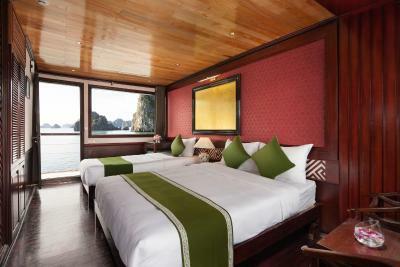 My advice, I know this may be the most expensive part of your trip, Do not stay for only one night!! You will spend most of your time in a bus. This was a wonderful experience. Being on Bai Tu Long meant it was so peaceful and less crowded. The waters were clean, the view gorgeous, and an overall great experience. 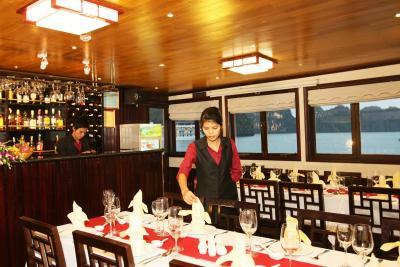 The boat was well presented, facilities were decent, the staff were mostly great. Special mention goes to Le, our guide who made everything perfect for us. He works hard to please and is very professional about everything. Food was great and the itinerary well planned. We had a very relaxing time just enjoying each other’s company in gorgeous environments. Toilet/shower only had a curtain separating it from bedroom. Friendly staff, amazing views and food was first class. 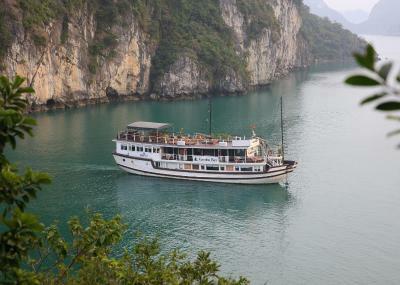 The trip with the small rowing boats between the limestone rocks and the good food on board.